Photograph 1 - Not long after lift-off at Las Vegas. 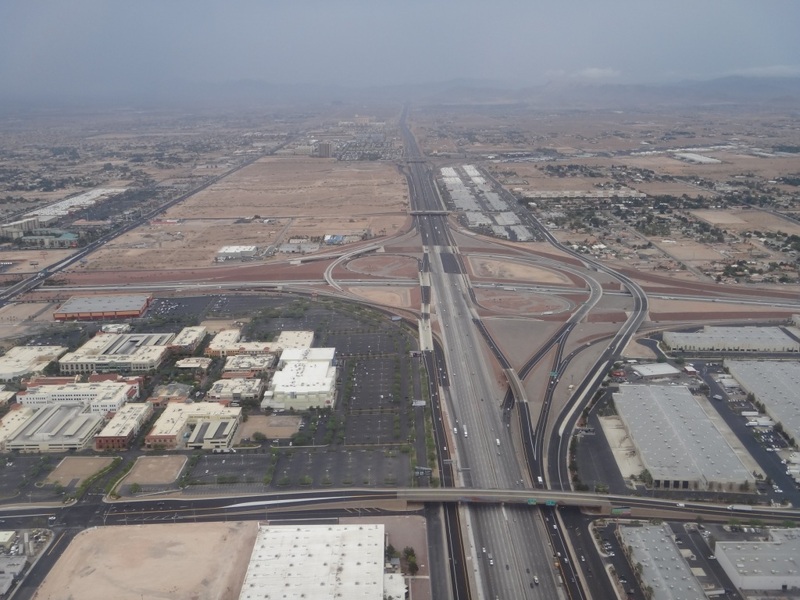 The turnpike below is a small one compared to the bigger cities. 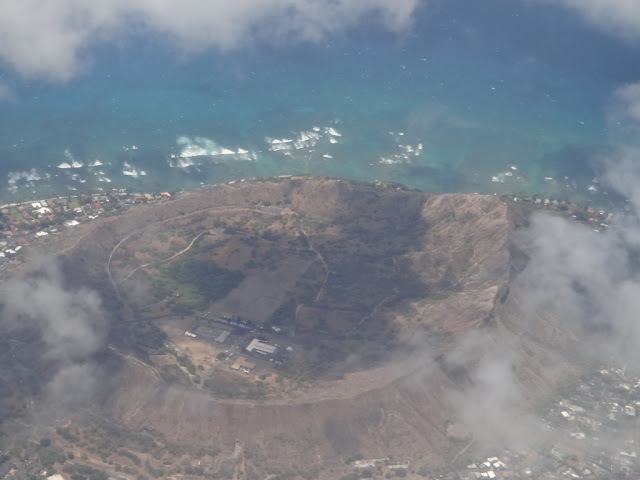 Photograph 2 - Diamond Head Crater, Honolulu, Hawaii from the air. Photograph 3 - Ford Island, Hawaii. 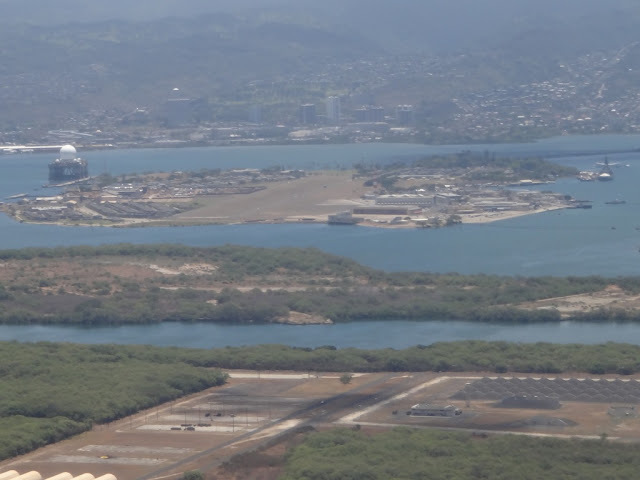 The USS Arizona Memorial is to the right of the island. 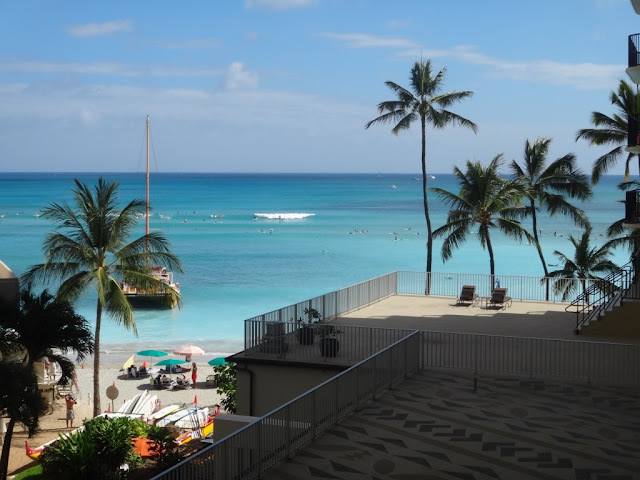 Photograph 4 - Waikiki Beach from our balcony - Outrigger Waikiki On The Beach. Not much to say on this Friday the Thirteenth except that it was lucky for us. First, when we checked at Las Vegas Airport Hawaiian Air gave us First Class seats and secondly our over-weighted bags were okay. All we did was asked if there were first class seats available and for a nominal fee we had seats 3A and 3B. In addition we were allowed in their Club Lounge at Vegas and skip the huge lines as we went through security and boarding. It is the only way to fly. Hawaiian Airlines are great and highly recommended for those who are thinking of travelling to Hawaii. Their service is faultless and for a six hour flight the time just went fast. We actually left Las Vegas in drizzle - yes- it actually was raining. We arrived in Honolulu at 12:15pm and could not obtain a room until 3pm...so...we hit Dukes Bar for some lava flow cocktails and a bite to eat. Nothing has changed since we were here ten weeks ago (it seems like an eternity). Dukes Bar is still crowded and the traffic just as congested - but it's great being here. The weather is just right, temperature in the low 30s and the ocean as blue as can be. Why do we have to go back to Oz in three days time?? We have a booked luau tomorrow - being picked up at 3:30pm and hopefully going the have a great feast along a golden beach. We'll tell more about this tomorrow. Cheers.